Website & e-comerce solution where none existed previously for J. Tarnow Company. J. Tarnow Company has been around as a family owned business for over 70 years. 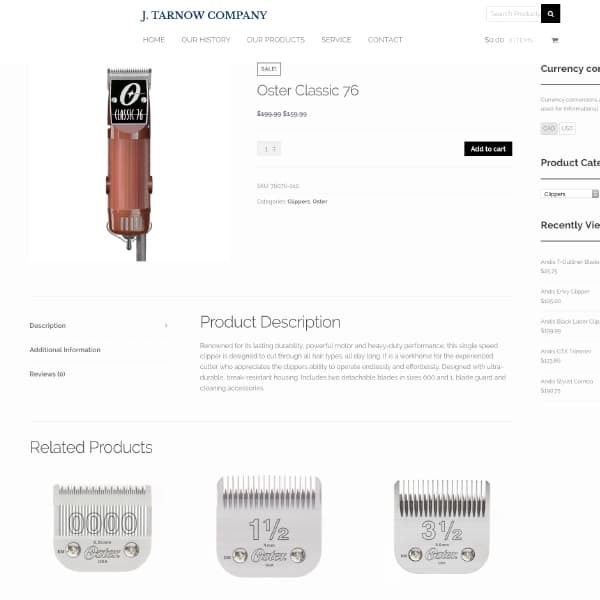 J. Tarnow Co. has represented manufacturers of fine professional barber and beauty supplies and animal grooming equipment in Canada. They approached us with a strong desire to enter the digital realm of e-commerce. They have a significant inventory of barber and beauty supplies that they wanted to shift to an online catalog in order to cater to their growing US and Canadian customers. Training and integration of inventory and streamlined shipping systems was the primary challenge during the course of this project.